I spotted the L'Oreal Confetti Topcoat while on a marathon blog catch up so I can't even say where I got the idea to buy it. All I know is that it immediately went to the top of my shopping list as soon as I saw it and it was the first thing in my basket when I got to Boots. Here I've layered it on top of Raggae Splash from the Rimmel Salon Pro Kate Moss range. Which I like but something about me isn't in love with it. It could have been my impatience, but I couldn't get it opaque after three coats ... so I'll have to try one more time. But the top coat I adore! I love the fact the "glitter" is matt and there are three, yes three, sizes inside! The big hexagons, smaller speckles and tiny tiny specks of glitter. Love. Love. Love. I know it will date horribly quick, but until then I'll be wearing it as much as I can. Colour me obsessed! If you haven't fallen in love with the L'Oreal Confetti Topcoat yet, then check out Makeup Savvy's 5 Ways to use L'Oreal Confetti Topcoat and you'll see why I'm so crazy about it. 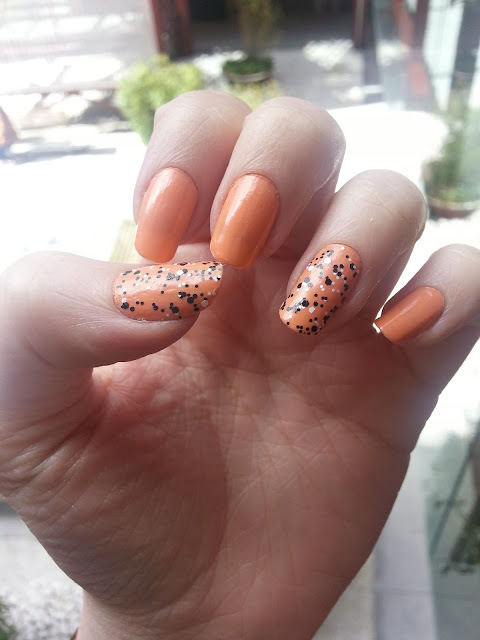 How do you feel about the Confetti Topcoat? Or the new Salon Pro line for that matter?